CTHULHU'S RISING is energetic with pounding and clanging drums underscored by eerie ambience! Theme = Cthulhu-inspired ambient horror music! The perfect creepy score! Originally written for an indie horror film that draws inspiration from the dark and twisted Cthulhu mythos. This is the title track from the album. Theme = Cthulhu-inspired ambient horror music! 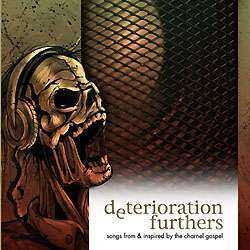 DETERIORATION FURTHERS is composed and produced byBryan K. Borgman (aka Stratos) and T.W. Cory (aka Capt. Futura) ofBailey Records Composition and Sound Design -the same team that brought you the CyberNet Official Roleplaying Soundtrack. CTHULHU?S RISING is energetic with pounding and clanging drums underscored by eerie ambience! Originally written for an indie horror film that draws inspiration from the dark and twisted Cthulhu mythos. This is track #4 from the album Deterioration Furthers, Songs From and Inspired by The Charnel Gospel and scores the campfire feasting rituals of the ghouls and their prey. Lonesome October Nights is from Deterioration Furthers, Music From and Inspired by The Charnel Gospel. This song is suitable for any Cthulhu or horror setting. Category = Horrific Universe - "horror music"
Originally written for an indie horror film that draws inspiration from the dark and twisted Cthulhu mythos. This is the second track on the album. THE CREEPING FEAR features dark and ambient beats, sounds, and sinister vocals and the title is taken from one of the many possible speculation titles for the third Star Wars movie. This title was added to our catalog on October 01, 2006.